Over the weekend, my family and I stayed overnight in New York City. It was so much fun! We had a great hotel located in the center of Midtown Manhattan and we stayed at the Hilton Garden Inn and Suites. Our view of the Empire State Building was spectacular. The first day we explored the city and ended up heading downtown to the Sézane L'Appartement. I've seen this spot pop up on my Instagram feed for the past few months and knew I couldn't miss out on my chance to see the floral apartment for myself. It was simply a Subway ride on the F train away and a few blocks down the street until we finally hit the apartment display. A must-have for the city? Walking shoes! 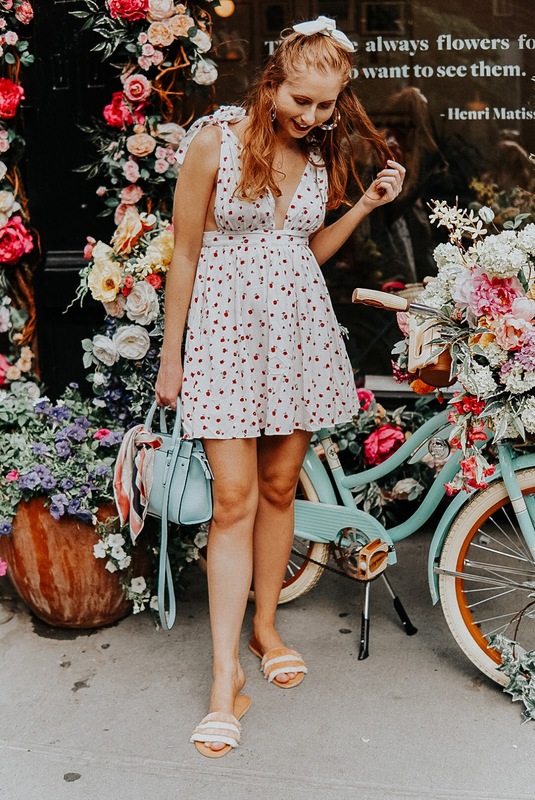 If you are looking for a cute photo opp in the city, I highly recommend checking out this beautiful area because it's the perfect summer location to shoot some Instagram photos with friends, too! For my daytime look out to Elizabeth Street, I wore a Forever 21 Ditzy Floral Dress and a fun pair of fringe sandals from Dolce Vita. In the city comfort is key, but I also needed to plan ahead for upcoming photos for the blog. This dress was also hanging up in my closet waiting to be worn out! It's priced right at $22 from Forever 21, so it's definitely a great buy. Surprisingly enough these slides from Dolce Vita were also pretty comfortable, even though I was spending the day breaking them in! The fun fringe detail on the top of these slides makes them adorable and easy for packing this summer. Just in time for this Summer's Nordstrom Anniversary Sale, I’ve teamed up with a group of bloggers to give you a chance to win a $850 Nordstrom Gift Card! To enter: complete the steps in the rafflecopter below. The more steps you complete, the more entries you receive, and the better your chance at winning! This giveaway runs until end-of-day 7/19 at 11:59PM EST.